As I’m sure I’ve made clear, I am a fan of Final Fantasy games. They’re great! If you haven’t played them, I’d recommend that you try a Final Fantasy game or two. What makes them so good is that they contain some common ideas, tropes, etc. without having to be the same story, world, rules, games, etc. through the series. Each one has its strengths and weaknesses that differ from the others, so there’s one that almost anyone will like! Before I discuss this topic, I want to say that I love all of the characters from Final Fantasy 7! Aeris included! I am just referring to the romantic relationship possibility in the game. This will obviously contain spoilers, so don’t read any further if you don’t want spoilers for Final Fantasy 7! I’ll also include some info from Crisis Core, but that won’t be of a spoiling nature. In the game, you can go on a date with one of: Aeris, Tifa, Yuffie, or Barret. There’s a system of points being assigned based on choices you make through playing. I’m less concerned with that choice in the game and more concerned with who I think our spiky-haired protagonist should be romantically involved with as part of a story. Yes, this is a common discussion among gamers who play the game. Both Aeris and Tifa express a romantic interest in Cloud during the game, but there are a lot of details we should be considering when playing the game. Some would say that Cloud should be with Aeris, the attractive flower girl of the slums who Cloud meets early in the game. Others, including I, would say that Cloud should be with Tifa, his childhood friend by his side through some of his greatest trials. Tifa is a childhood friend of Cloud’s; they’re close even though they weren’t that close as children. Cloud clearly meant something to Tifa even then, because she brings up the promise they made as children. Well, as it turns out, Cloud didn’t achieve his goal, so his promise would be void at the point that she said he didn’t keep it during the early scene in the bar. Maybe you had Cloud forgetting the promise he made to her. That would be the case, however, we learn that Cloud was at Nibelheim during the incident. In fact, he arrived in time to move Tifa’s body when she was hurt and even defeated Sephiroth through sheer will. Maybe that determination came from keeping his promise. Falling into the lifestream and being carried away, Cloud was on the verge of death. When the party finds him, after the portion of the game with Tifa as the playable character, she decides to remain with Cloud while the remainder continues on without them. Yes, I understand that Aeris is understandable dead at this point, but I believe Tifa would’ve stayed with him anyway. Regardless of the type of love, romantic or friendship, this shows Tifa’s love of Cloud. She was part of AVALANCHE before Cloud, so her leaving the group to stay with him is significant. It’s not like he’s talking, and he may not even know she’s there. It’s meaningful though. 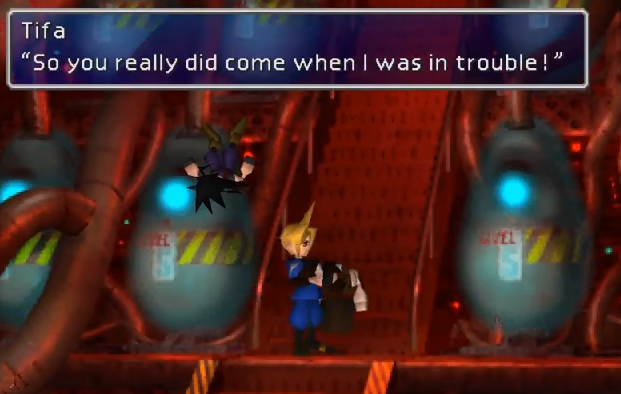 Eventually Cloud’s mind is sorted out, and we separate Cloud from Zack as part of this recovery. Tifa is there, helping to guide his recovery the whole way. In many ways, this has to be done by the person closest to him, since he doesn’t even trust himself at this point in the story. Even his own memory cannot be trusted, which means that she is even more important. It’s not just comparing those memories, however, he’s allowing her to help guide him as he figures things out. She’s in Cloud’s mind during this recovery, a place that only the closest person would be invited in. First, I care nothing of the death of Aeris in this argument. Were she my choice, I’d have been OK with her having died in the game and still be the right woman for Cloud. My main reason is that Cloud is not right for Aeris, and my argument follows that same line of thinking that death doesn’t change anything. Aeris is not in love with Cloud, and Cloud is not in love with Aeris. She loves Zack Fair, the SOLDIER First Class whose identity Cloud has assumed by becoming Zack’s “living legacy”. I believe that Aeris expresses interest in Cloud because he’s similar to Zack in many ways. 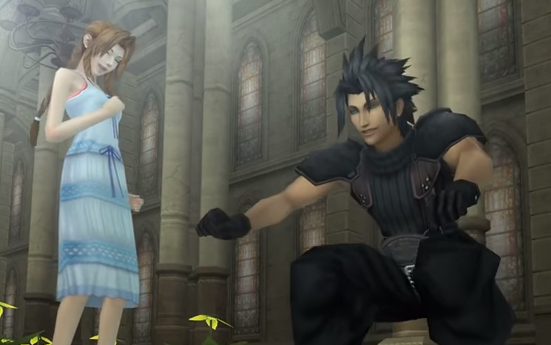 And Zack expresses Zack’s interest in Aeris, which is easy considering that Cloud knew about Aeris from Zack. With his confusion and goal of being Zack’s living legacy, dating Aeris is the obvious thing for him to do. I’m sure plenty of people will disagree with my stance, but I will always pick Tifa. When playing the game, I might play the game such that a different date happens, but I’ll always hold Tifa and Cloud in a special place. They’re meant for each other. What can I say though, I married someone I love, and before we were dating, we were friends. I think it’s a good foundation to build from, and I think it’s one that Tifa and Cloud can work from as well. With weekends only having 1 page, I’m at page 16, which means I’ll be about 52 days short of 365 for the year. By my calculations, I’m about 1/20th of the way through the calendar. Daunting! This set of topics looks interesting though! Today I’ll be naming Four Games with a Zombie theme, Two Batman Love Interests, and Two Classic Yoda Quotes. Not sure what I’ll trim the lists down to here! These have certainly been popular over the years! Slow zombies, fast zombies, smart zombies, dumb zombie, a nerd’s book by Zombie Seuss. I liked how open-ended this question is, since it also allows for both board and video games. Based on its saying “a Zombie theme”, I would think it would need to be more than just having a zombie or two in it. Zombies are in D&D for example, but it’s not zombie themed. A classic game that was utterly terrifying when it first came out. It’s a bit laughable now, but graphics and gameplay have come a long way since the original of these hit store shelves. In some ways, the restrictive camera and difficult controls made the game harder and scarier. The game takes place in a mansion filled with zombies. I’ll not dive into the lore, but I will say that it’s extensive. The game features an exploration element, because you can learn more about the lore by exploring more locations and reading as you play. I’ve not played this game enough times yet, but I’ve enjoyed it when I have. This is a (mostly) cooperative board game where the players take control of survivors struggling in in a zombie apocalypse scenario. The game mechanics work well as you try to feed everyone and defend yourselves against the hordes. Not exactly the most strategic of games. This one has a large bag full of plastic zombies, and you’re exploring city streets trying to find a helicopter to escape. Also, yes, those exclamation points are in the title of the game. The cool mechanic in this one is that players move their own survivor piece as well as the zombies, so other players can really mess you up! Good luck surviving! Fast zombies! This was one heck of a crazy game! This is a first person shooter, cooperative game. You work as a team traveling from one safe house to the next, killing zombies and trying to make it to the next stop in one piece. Ammo and medical supplies will be there, so get there before you run out. This game’s zombies often run right at you, so it was fast-paced excitement when it came out. Superhero romance is always a dangerous issue, since it often means the pairing of two already-known characters. That leads to a circumstance I’m not keen on. I’ll explain what I mean by this in my selections. If you’ve seen movies, cartoons, or comics, you know this is a thing. Even if nothing exists in the content you’re viewing, there are often hints at past/future interest between the two. Catwoman isn’t just straight up villainous, which is what makes her such an interesting character. She’s teamed up with the good guys before, and has motivations for what she does. I am fairly certain there was at least one story arc where Batman and Wonder Woman were at least somewhat romantically involved. I’m not a big fan of the concept, however, as too often female characters only exist as the male character’s love interest. Wonder Woman is great, and my opinion of her as a character increases as I learn more about her! Is it a thing that supers go for other supers? Maybe. I’ll follow the rules and only pick two for this one, but Yoda imparts some great wisdom on Luke in the short bits of conversation shown on screen. I took “classic” here to mean that the quote should come from the original trilogy only. When Yoda lifts that X-Wing using only the power of the force, Luke doesn’t believe what he’s seeing. Yoda informs him that it’s the reason he failed, which in talking about the force makes a lot of sense. It also makes plenty of sense for us as well. When we approach a difficult task, expecting it to fail, we’re setting ourselves up for failure. We’re not trying as hard, since we’re expecting a failure anyway, why would we try as hard? Why would we make adjustments to try and make it succeed when we’re expecting failure anyway. Luke went looking for the “great warrior” Yoda to train him, but that’s one way in which Luke is terribly wrong-minded when he reaches Yoda. He believes Jedi to be warriors. This is an easy misconception given the little he knows of them (and his previous training). He was first taught about a Jedi weapon and told about a war, but Jedi are really the peacekeepers of the galaxy (or they’re supposed to be). Greatness isn’t about who can defeat whom in battle. Great people improve the world around them and help other people. Yoda has fought in war, but it’s not what makes Yoda great. In The Empire Strikes Back, you don’t see Yoda teaching Luke to wield weapons and fight opponents. He isn’t shooting at human-shaped targets with a blaster or pointing a lightsaber at them. He’s learning to center himself and control his own body. He’s learning to become a better person. A Jedi. Did I seriously just succeed after catching up? That’s awesome! Keep watching next time for some more geeking out! The next one will be about fantasy, general geekiness, and gaming. Coming to the end of week two of this challenge, I’m attempting to Geekout with this page-a-day calendar I’ve received. It asks me to list a set of things each day. Today, I’ll need to come up with Six Video Game Consoles, Two Comic Book Characters with Cat Attributes, and Four U.S. Cartoons with Alien Creatures. These don’t look all that challenging. All three are open-ended questions again, so I think I’ve got them in hand. When I was a small child, my brother and I asked our parents for an NES for Christmas. My parents said that we couldn’t afford it, so we’d have to ask Santa. Christmas morning came, and no console was found under the tree. Later in the day, my family was all treated to small me screaming about something down in the basement. I assume my parents must have sent me downstairs to get something from down there. The console wasn’t under the tree, it was hooked up to a television in the basement. My first video game console. And boy was that a ride. Nintendo’s venture into 64-bit consoles was something they’d been talking about for a while. I remember watching promotional videos Nintendo sent out on VHS tapes talking about the system. I read many articles about the system before its release. The year that console came out, it was hard to find. Places sold out of them quickly. Somehow my parents managed to get one. My father had a cool idea for how to wrap it. I loved the idea so much then, and it has inspired me to do some creative work of my own. The console was under our tree for a while before Christmas. It was wrapped together with games, additional controllers, and some extra pieces of cardboard. The interested part is that it was a uniquely shaped gift. It was shaped like some kind of poultry, maybe a chicken or a turkey. It was blocky, but you could tell what it was. When my brother and I were little, we saved our allowance money for years. We didn’t receive as much as most people we knew, but we also knew that saving it meant you could get better stuff with it. This is one example of that paying off. In fact, this console is not ten feet away from me right now and still works well, which is impressive for being the initial model to hit stores. We bought it when the price was still $300. This is one of my all-time favorite consoles, having been host to so many great games! I loved that this generation had both cartridges and discs, since both had advantages at that time. This system was a true marvel, being a success right out the gate. Microsoft’s entrance into console gaming didn’t go as well as Sony’s. Their first console wasn’t as hugely successful, however, as we all say, the second time’s the charm. The 360 was a massive success, not just for having improved their game library, controllers, and system itself. Their true win was in their online support. Xbox Live may not have been free, but it worked so well that it destroyed its competition. Being the only Sega console I owned, I had to name it here. It had some great games, including the more violent version of Mortal Kombat. The console was fun, however, Nintendo did have the better controller in that generation with the SNES. Sorry, Sega. This classic, famous console is old and goofy. I know some people love the wood-paneling along the side, but I think it just makes it look older. Joysticking was still the thing for this machine. Helping to contribute to the crash of game consoles, who could leave it off of the list? Since I incidentally named other consoles in previous bits of text, I’m going to allow a handheld console in here. The original Game Boy was awesome; I played that handheld so much. My Game Boy is also within 10 feet of me right now. It’s right next to my two Game Boy Pockets and my Game Boy Color. I’ll lump those together for the most part, since Nintendo was brilliant enough to have them play the same games. Unlike the competition, Nintendo realized that quality games and battery life were far more important than colors an specs. This brick of a handheld only showed images in shades of green, but it did so for hours on far fewer batteries than the competition. I remember using the magnifying glass and light combo adapter to use at night. I also was one of those people who caught the Pokemon craze immediately, picking up the game as soon as it released in the US. Thinking about what “Cat Attributes” might mean, I’m going to decide that naming actual cats would be outside of the spirit of the question, so Luna will not be listed. I do, however, think you can have “cat attributes” without physical feline traits; whiskers on humans will not be a requirement for this. Too obvious on this one? Cat-like? Absolutely. I will say that giving her a movie of her own may have been a mistake… She’s a fun character, because she’s not just a straight up villain. They’ve brought him to the big screen, and it’s good. Great work, Marvel! Do this character well! I am looking forward to his having his own movie! Well this is going to focus on some of the weirder characters from cartoons. While it’s not a show I watch, I’ve seen more than a few episodes of it. I included it, because it’s a show that prominently features an alien and isn’t sci-fi other than that (as far as I know). I’m sure you forgot or are trying to forget that this show had an alien! The great Gazoo, if I recall the name and spelling of that green, stereotypical alien thing. For as much of the Simpsons as I’ve seen over my lifetime, I’m blanking on the name of the two green aliens from the show. They’re cycloptic , tentacled alients wearing tall, nearly-cylindrical space helmets. Also, I didn’t want to list Futurama, since that seemed too easy. There are a couple of aliens here, including my favorite bean-loving idiot, Brak. If you’ve never watched this show, you missed out. It was one of my favorites as a kid. Yes, I’m going to playing a bit of catch up on these! I was unable to publish each day, so I’ll be doing a couple of these some days until I catch back up! Nope. Can’t get out of this streak yet! I just don’t know real people’s names! Sorry, but it’s kind of my thing. While yesterday, I didn’t know He-Man well enough. Today I’m struggling to remember who Frank Miller is and what works he’s done. I’m supposed to name Four Fictional Scientists in Television, Four Video Game Protagonists that Don’t Wear Pants, and Two Frank Miller Comic Books. I’m already having a laugh about that gaming question. The general geekiness and comics questions are normal questions. Wishing this weren’t restricted to television, because I know a steely-eyed missile man I’d like to be naming right here. Well, there are more than enough scientists on television, so here goes. I’ve mentioned his sister Dee Dee already, so I might as well mention him as well. The titular character of the series, Dexter is quite the scientist (not just for his age). His lab, experiments, and creations make for some fantastic episodic fun in the show. I don’t even know if we’re rooting for him to succeed or not most of the time, but he’s a wild character for sure. With a Ph.D. in astrophysics, she makes an awesome part of the SG1 team. She speaks nerd with Daniel and military with O’Neill. She may be a military woman first, but her science background is vital at points during the show. While Dr. Jackson may be the one referred to with the title, it’s only because her military rank is used instead. Her promotions through the series are also quite useful, since it lets you know where you are in the series when someone calls by rank. Being a famous scientist is what got him to safety in the first place, and set him up in a great position with the fleet. He’s a very fun character in the show. I don’t want to get too far into things, but some of his decisions are quite enjoyable to watch him make! And if you ever play the Battlestar Galactica board game, be careful of trusting this character. I wanted to choose one of the many Science Officers from Star Trek, and I figured Spock was as good a choice as any. I think being the Science Officer of the Enterprise would qualify you as a scientist, don’t you? I’m not sure how much I need to say about this pointy-eared alien. When you think about it though, you can choose nearly all of the characters in The Federation, since being a scientist is basically a requirement for all of them! Some characters I’m having trouble remembering if they wear pants or not, so I’m avoiding them just in case. With cartoony characters either wearing just a shirt or just pants is sometimes a thing! And for clarification, I’m interpreting this as no pants, shorts, skirts, etc. It would be way too easy a question if it allowed dresses and skirts to count! The pants would only slow him down. Shoes and gloves are all that are required for speed! The Blue Blur has so many games, but his originals are the real classics we all love. If you’ve never played a sonic game, they’re classics of the 2D platforming genre that you should play. They’re old games, so most of the gameplay was in replay value. That means the time commitment to “have played it” is very minimal. Now if you enjoy raunchy, inappropriate humor, this is your Squirrel! My introduction to him was in one of my all-time favorite racing games, Diddy Kong Racing. He wasn’t so out there in that game, but he ends up in the gutter and down the toilet in his own game (sometimes literally). He was the protagonist of Conker’s Bad Fur Day, and I think many parents were surprised the cute red squirrel game was rated M.
Could’ve gone with Diddy as well, but figured the classic made the most sense. I believe his only article of clothing is a tie. This was a wonderful game from my childhood. I remember going crazy for this game. It was remarkable what they did with the series as well. I still listen to the music from this franchise. The character design for this guy was wonderful. Don’t let his lack of pants dissuade you from playing this classic series of games! Meat doesn’t need pants. Plus, it would get caught in all of the gears and such. Who wants to eat that? This guy is from a crazy platforming game that really is a lot of fun, which I think might surprise some people. You play as a moving, slab of meat sliding and jumping on floors and walls. Yep, it’s not a normal game. Fun though! After some thinking, I think he’s the 300 guy. That’s all I’ve got. I know I’ve heard that other stuff was created by the creator of 300, but I just can’t recall what it was for. I know the others have to be realistic, gritty stuff, but I don’t want to guess. Surprisingly I never saw this one, but it’s on the list of movies I want to see. I may read the comic book. We’ll see if I’ve got the time for it! My wife was trying to get me to think of what might have worked on (I’m sure she knows plenty! ), but I said I didn’t want to be giving guess answers. So I’m adding some thoughts here instead of guessing. I know they’ve got to be gritty comics. He might have done some Batman comics for DC, since Batman tends to have darker, grittier stories than many other heroes. I could see him writing for one or more of the Defenders characters on the Marvel side; Daredevil, Luke Cage, and Jessica Jones all seem like characters he could work with. And I’m probably even guessing on these lines based on her thinking I would be capable of guessing them. I’m hoping a future one of these asks for works by Alan Moore, since I could name a few without even trying. I’m really enjoying the open-ended ones though, where I can choose from any franchise I like. The first two questions today are great examples of that! And my streak of successfully listing answers for the page-a-day calendar comes to an end. I can’t get this one. Today I’ll need to list Two Named Animals from Beastmaster, Four Dr. Seuss Book Titles, and Two Named Victims in Assassin’s Creed. I don’t know Beastmaster at all, so I don’t have anything to list for this one. I did a quick search, and it seems like it might be a movie. This is more of a “do you remember your childhood” question than anything all that geeky. Did non-geek children read something else? Well his books are certainly some of my favorites today. Not just because of how well-written and entertaining they are, but also for all of the great lessons they teach. I’m not really the adventurous type, but this book does make life seem like a wonderful journey. The places I’ve gone have been interesting. Some sneeches have stars on their bellies others don’t. None of them are better than the others, but before anyone learns that lesson, everyone is willing to pay a lot to always be the “better” type of sneech. I think there are plenty of things you can take away from this story, beyond the obvious ideas of equality among people. You could also interpret that you don’t need to always be chasing the popular things to do. If everyone is buying the greatest new stuff, you don’t have to. You can be yourself. You’re already pretty great! I’ll admit, I’ve never tried green eggs and ham, and I don’t try as many new things as I probably should. I do know in my mind, however, that making judgements without information is a mistake. Whether that be about food or something else doesn’t matter. Speaking for the trees is an important thing, since they can’t speak themselves! I admit, I need a thneed, but I’d rather find a more sustainable way to get my thneed. Perhaps we could try cutting and replanting the trees only in one place? Assuming we could produce enough thneeds for everyone’s needs, I think we’d be OK.
And this page gets me again. I’ve played only the first of this series. I own a few of them, but I want to play them in order. Having started the first a few times, but never completing it means I don’t know any target names. I did not expect two on the same day to end that streak. I guess I need to get around to playing Assassin’s Creed again. One of these days I’ll finish it, but I’m always distracted by other games I’m playing. Too many games, books, movies, etc. Too little time.